10/25/18 – KBE Building Corporation recently completed construction on the Colaccino Center for Health Sciences at American International College (AIC). KBE provided General Contractor services for the two-story, 6,000 sf renovation and 15,000 sf addition on AIC’s Springfield, Mass. campus. 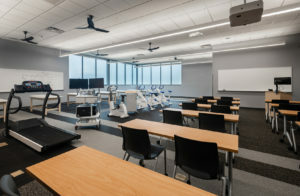 The newly renovated building and addition, named the Colaccino Center for Health Sciences, provides a variety of labs, rehabilitation, and human-performance spaces, and allows for clinical simulations. 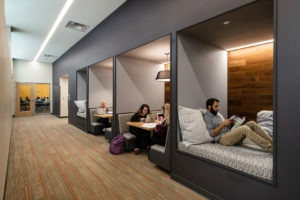 The multi-functional lobby is designed for student gatherings and hosting small events, and includes a variety of interior lounge spaces and a courtyard. “This impressive, state-of-the-art facility provides an educational environment that allows for and advances interdisciplinary learning as we develop highly trained, healthcare clinicians ready to employ their skills in the workplace,” said AIC President Vince Maniaci. The College hosted a grand opening event on Oct. 24 in Springfield. The building is named after AIC Chair of the College’s Board of Trustees and alumnus Frank Colaccino ’73; Honorary ’12. Colaccino is the founder, president and CEO of The Colvest Group in Springfield. Founded in 1885, American International College is a private, coeducational, doctoral granting institution comprising the School of Business, Arts & Sciences, the School of Education, and the School of Health Sciences. AIC supports and advances education, diversity, and opportunity for its students and the community. Photographs by Paul Burk Photography.